Another quick must-have in the world of StellaBella - the one and only, Rubber Band Ball! This was a project from my childhood, that my grandmother & I started, and I have hung onto it all these years. I started mine with a regular jack, from the classic childhood game. 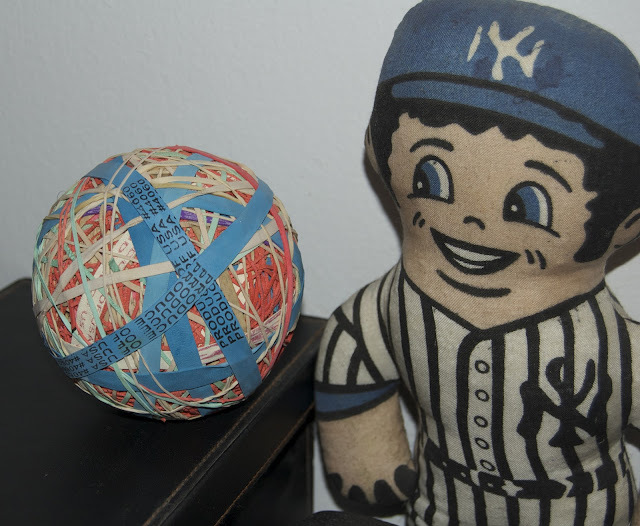 There are more rubber band ball purists out there who believe the center should only be rubberbands, but this was the way I start mine. As you keep adding on, twisting and wrapping each band, make sure to switch up the directions so each new band overlaps the last in a different direction. It's really easy to get going, and it is the perfect place to store all of those vegetable and flower bands we can only imagine collect and pile up in a landfill over time. Why not keep them in one fun place? I know the size of my rubber band ball is pretty impressive (size of a softball now), but it is amazing and fun to see how quickly it can grow! 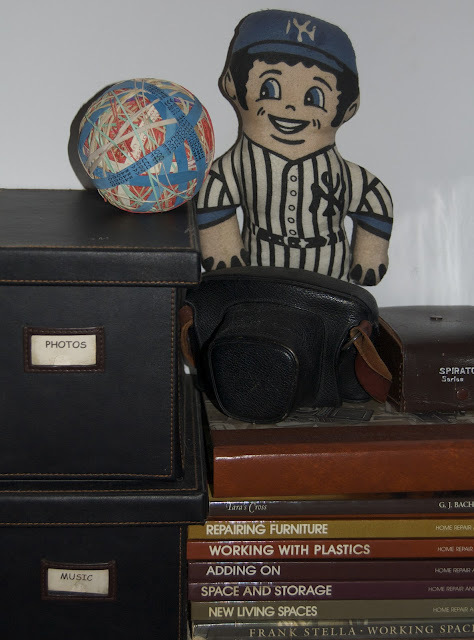 The New York Yankee doll in the photo is another childhood item that I made sure to incorporate into the decor. These are the type of items that warm up a modern look, and personalize your home to your own liking. I'd like to think this doll brings my team good luck, as we enter (yet another) post season rally! Back to work for now, I hope everyone has a wonderful Monday - I have a feeling it is going to be a long week!